Hello and welcome to our live coverage of stage 5 of the Volta a Catalunya. Today's stage runs 188km from Puigcerdà to Sant Cugat del Vallès, and will likely be one for the sprinters or the break. The riders will be setting off soon for the start of the stage from the border town of Puigcerdà, near Andorra. Today's finish in Sant Cugat del Vallès lies just inland from Barcelona. The E3 Binckbank Classic is getting underway soon too. You can follow that race live here. The peloton will be climbing right from the start today, up to the first category climb of Port de la Collada de Toses (20.5km at 3.1%). It's hardly representative of the stage though, with a long downhill followed by a third category climb and then a few lumps on the way to a flat finish. The peloton has rolled out in Puigcerdà. The peloton are still in the neutralised zone at the moment. Astana's Miguel Ángel López won yesterday's stage to La Molina, taking the leader's jersey in the process after attacking an elite group with 8km to go. He now leads Adam Yates by 14 seconds in the general classification and looks likely to take the race win on Sunday. Read our stage 4 report here. Unlikely we'll see López active in the later stages today, though. This will be one for the likes of André Greipel (Lotto-Soudal), Álvaro Hodeg (Deceuninck-Quick Step), Michael Matthews (Team Sunweb) or Daryl Impey (Mitchelton-Scott). Two riders didn't take the start today – Enrico Gasparotto (Dimension Data) and Maxime Monfort (Lotto-Soudal). No breakaway to report as of yet. The riders will still be on the first climb of the day. Here's the top four men over the top of the climb. Bert-Jan Lindeman (Jumbo-Visma) led the way, followed by Tejay Van Garderen (EF Education First), Andrey Amador (Movistar) and Thomas De Gendt (Lotto-Soudal). More points for De Gendt, then. There's a long stretch of downhill road now – almost 50km until the road rears up again to the next climb. The next climb of the Collet de Sant Augustí won't be a big challenge for the riders. It's 4.1km long at an average gradient of 4%. After picking up four points over the top of the first climb of the day, Thomas De Gendt now has 51 points in the mountain classification. He leads Gregor Mühlberger (Bora-Hansgrohe) by 11 points. A few riders are up the road on the descent. Max Schachmann (Bora-Hansgrohe) and Tejay Van Garderen (EF Education First) lead Andrey Amador (Movistar) and Bert-Jan Lindeman (Jumbo-Visma). There's only 30 seconds between the lead duo and the peloton, so it's unclear if they're actually attempting a serious breakaway on this largely flat stage. The Schachmann group was 19 seconds up on the Amador group, and 33 seconds up on the peloton. The various groups will still be on the long descent from the Pyrenees now. Michael Matthews (Team Sunweb): "Potser hi ha sorpresa i podem buscar la victòria". Well it's a strange group for this stage but Van Garderen, Amador, Schachmann and Lindeman are the break of the day. They're 2:25 ahead of the peloton. Schachmann is the best-placed on GC, lying 3:52 down on López. Van Garderen is 23:31 down, Lindeman 39:34 and Amador almost an hour. It's unlikely that the sprinter's teams will let this four-man breakaway stay away until the finish... Why not let us know who you think will take the stage win in Sant Cugat del Vallès? Tweet your thoughts @LVCKV. Our coverage of the cobbled classics is ramping up, with live coverage of the E3 Binckbank Classic going on right now here. Here's our preview of E3, and we also have a feature on AG2R La Mondiale rider Oliver Naesen, who finished second at Milan-San Remo, and is looking to challenge at the Tour of Flanders in particular. One of today's contenders is out of the race. Álvaro Hodeg (Deceuninck-Quick Step) has abandoned after being dropped from the peloton. Amador led Van Garderen and Lindeman over the second climb of the day at Port de Collet de Sant Agustí. They're three minutes up on the peloton. Going by the images we're getting from the race, it looks like Schachmann has dropped back from the break. He was, by some distance, the best placed rider on GC to break away. Schachmann leads the break over the intermediate sprint at Perafita. Amador and Van Garderen take second and third. We're in for around 50km of lumpy roads now, though no further climbs. The second intermediate sprint is just over 80km away. We're into the final 100km of the stage now. The break are still only three minutes up the road, so it's looking unlikely for them to stay away, despite their relative strength. André Greipel is Arkéa-Samsic's option for a sprint finish. The 36-year-old German has taken one win so far this season for his new team, at La Tropicale Amissa Bongo in January. Here he's searching for a first WorldTour win since the 2018 Tour Down Under. Mitchelton-Scott's Daryl Impey has won a stage of this race before, back in 2017 where he beat Alejandro Valverde and Arthur Vichot in a reduced bunch sprint (shown below). Earlier this season the South African won a stage and the overall at the Tour Down Under, and last month became national champion on the road and in the TT. Alejandro Valverde himself is an option too. The Movistar man hasn't been at his best in the last two mountain stages, but was second behind Michael Matthews on the uphill finish on stage two. There are some outsiders too, including Hugo Hofstetter (Cofidis), Ryan Gibbons (Dimension Data), Patrick Bevin (CCC Team), Phil Bauhaus (Bahrain-Merida) and Jay McCarthy (Bora-Hansgrohe). Meanwhile, Álvaro Hodeg (Deceuninck-Quick Step) left the race today. Finally, Michael Matthews (Team Sunweb) is the in-form pick. The Australian has endured a crash-hit early season, but looked to be coming into form at Milan-San Remo after putting in a valiant chase behind the lead group down the Poggio. He won stage 2 here of course, so will be full of confidence today. Axel Domont (AG2R La Mondiale) has left the race after a crash. The action is kicking off in the final 80km at the E3 BinckBank Classic. Follow the race live with Dan Benson here. Back to Catalunya and there's no change to the situation. The four-man break are still up the road, around three minutes up on the peloton. Live television pictures are set to begin shortly, so more updates will come with them. The race situation is still the same. 65km to go and the break is 3:30 up the road. 2:40 between the break and the peloton. There's another group 30 seconds behind the peloton too, featuring Dan Martin. Inside the final 50km now and the Martin group is back in the peloton. There's 2:30 between the break and the peloton now. Dimension Data, Arkéa-Samsic and Team Sunweb are riding on the front. The four men up front are working well together but it'll still be a big ask for them to stay away until the end here. The riders are heading largely downhill for the next 10-15km. The break hit the flat after the descent. They're two minutes up on the peloton. Under two minutes as the break hit the final 30km. Arkéa-Samsic lead the peloton. Even Warren Barguil is up there working for sprinter André Greipel. The latest Cyclingnews podcast has hit the airwaves! Click here to listen to it, including interviews with Larry Warbasse and Matteo Trentin. Sunweb are still up there at the front of the peloton too, as the break's advantage slowly withers. With 20km left to race and just 1:30 for the break over the peloton, it's just a matter of time as to when they'll be caught. It's still Sunweb and Arkéa on the front. Bahrain-Merida are also up there for Phil Bauhaus. The break's advantage is down to a minute now. One last quick rundown of the contenders today: Matthews (Sunweb), Greipel (Arkéa), Impey (Mitchelton), Valverde (Movistar), Bauhaus (Bahrain), Hofstetter (Cofidis), Bevin (CCC), McCarthy (Di Data). A reminder that Hodeg (Quick Step) abandoned the race earlier today. Schachmann led Amador and Lindeman over the sprint at Sabadell, by the way, not that it particularly matters. Schachmann attacks the break over a rise in the road. Lindeman goes after him. Sunweb and Mitchelton on the front of the peloton. Schachmann is alone. Schachmann has 50 seconds on the peloton. 40 seconds for Schachmann now, as he navigates a technical section heading downhill. Crash at the front of the peloton as Kelderman (Sunweb) at the head of the group hits the deck. Those behind are forced to slow. This will help Schachmann. Still 40 seconds for Schachmann. Could he hang on here? 30 seconds now. Sunweb still leading the peloton, minus Kelderman of course. Mitchelton-Scott are up there too. No sign of Arkéa anymore. Schachmann's on a rise in the road now. The road rises until 1.5km to go. This could be the end as the peloton fly along, 25 seconds back. Schachmann's head and body are rolling under the effort. I think he might have a heartbreaking finish here. 20 seconds with 2km to race. Schachmann hits the downhill. There's a kick up to the line as well. 19 seconds back to the peloton. He's descending in the Mohoric tuck. Sprinting along now in the final kilometre. He's going to hang on! Schachmann takes the win! A sprint behind. Matthews leads the peloton over the line, around 15 seconds behind Schachmann. 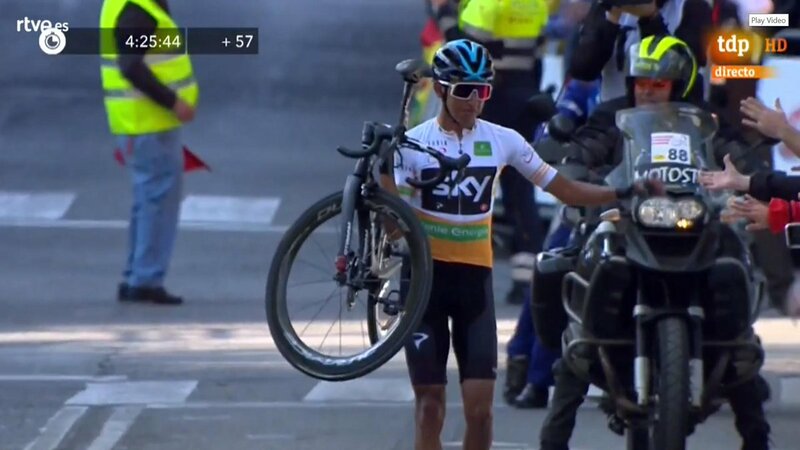 Egan Bernal looks to have hit the deck or had a mechanical in the closing 200 metres of the stage. Probably a mechanical as his jersey and shorts don't look torn. That's Schachmann's second win for his new team. He won the GP Industria & Artigianato earlier in the month. Gibbons rounded off the podium behind Schachmann and Matthews. Impey and Bevin were fourth and fifth. López retains the race lead, of course. He finished tenth today. The sprinters may have lost out today but there'll be another chance for them tomorrow, on the 169km stage 6 from Valls to Vila-seca. It's another day with climbs early on and mid-race but a flat 20km to the finish means Matthews et al will have a chance to atone for today's miscalculation. Anyway, that's all for our coverage of stage 5. Be sure to join me again for tomorrow's penultimate stage!